Georgios Samaras insists he is leaving Celtic against his wishes and that the Scottish champions have not offered him a new contract. Manager Neil Lennon said in January he hoped the 29-year-old Greek forward would extend his seven-year stay at the club. "It was not the manager's decision," Samaras told BBC Scotland. "It was people from on high. "I never had an offer from the club. I never had an offer from Peter Lawwell." Lennon will sit down with chief executive Lawwell in midweek to consider his summer signing targets and it appears that a replacement for Samaras will be a priority. "I'm leaving, that's for sure, but the only thing I want to say is it was not my decision," said the forward who joined Celtic from Manchester City in 2008 after a successful loan spell. "I'm a little bit sad that I'm leaving this great club." Samaras was free to speak to other clubs from the turn of the year, with his contract ending this summer, and he has been linked with several sides as speculation about his future mounted. "I did not speak during the six months," he said. "There were a lot of stories in the media, I did not answer anyone, I tried to keep my mouth shut. "I was full of respect for Celtic. I have not signed for any other club, I have not spoken to other clubs. "I was waiting until the end to see if they made me an offer, but I think that's the end. "I cannot lie to the people. I had a chat with the manager. He would have loved me to stay at the club. "But me and the gaffer, we don't make the decisions - there are people above us who make the decisions and they never approached me." Samaras marked what looks like being his final Celtic appearance by scoring a penalty in the 3-1 victory against Dundee United. He shed tears after firing past Radoslaw Cierzniak and later admitted: "It was an emotional day for me. I am leaving Celtic but Celtic will never leave me." 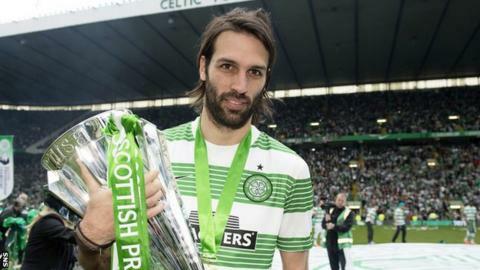 Lennon confirmed that it looked like Samaras would not be at the club next season. Asked if it was a farewell goal, the manager said: "I'd imagine so. There's been no negotiations ongoing for the last three or four months. "He hasn't really come to me and said he's leaving, but I'm assuming that's going to be the case." Celtic midfielder Kris Commons wished Samaras well for the future and, most immediately, when representing his country in Brazil this summer. "He will be sadly missed," said the PFA Scotland and Scottish Football Writers' player of the year. "Hopefully, he'll have a good World Cup and we'll all be cheering for him."